How do I un conclude a course? If an instructor has the appropriate permissions to conclude a course before the end of the term, Sublime LMS sets an immediate end date for the course and puts the course in an archived state for both students and instructors. However, as an admin, you can un conclude courses at any time if an instructor needs to have a course restored to the account. In Account Navigation, click the Courses tab. In the courses list , click the name of the course you want to un conclude. You can also search for the course in the Find a Course field . 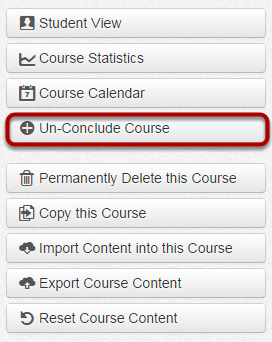 Click the Un conclude Course button. Verify that the course has been un concluded.